View Target Weekly Ad, Sales Flyer and Grocery Savings. Get This Week Target Ad sale prices, grocery sales & deals, digital coupons, and circular specials. The retailer offers Free Shipping on orders of $25+ & free returns on every order. Choose the Target REDcard (Target Debit Card, Target Credit Card) for everyday 5% REDcard savings, in-store and online, No annual fee, and everyday free shipping. Use Target GiftCards and specialty gift cards from Target like: dining, music, gaming, prepaid phone & calling, travel, Visa & MasterCard gift cards. 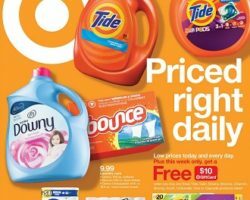 Target offers everyday offers, deals, sales, and free gift cards with purchase, every Sunday the Target Weekly Ad has the best deals of the week. Departments and Services: clothing, shoes, jewelry, home decor, furniture, patio, electronics, office, toys, video games, movies, music, books, sports, beauty products, grocery, household, photo center, Starbucks Coffee, Optical, CVS Pharmacy. Target is the second largest retailer in the United States. The retailer operates over 1800 locations.